Ever since I first laid eyes on the Coast to Coast Challenge medal at the 2013 Princess Half Marathon weekend, I knew that I was going to earn one of my own. It is the ultimate keepsake for a Casual Runner who also happens to be a Disney fan, and especially a runDisney fan. 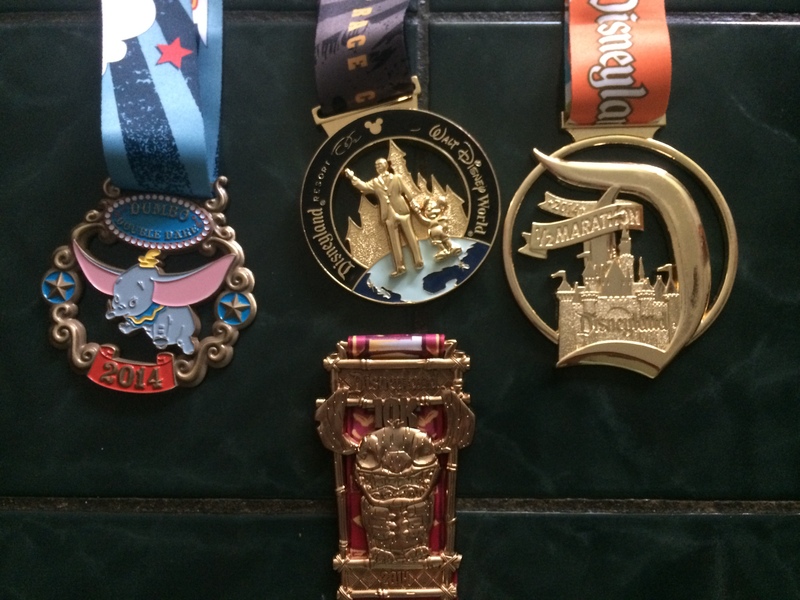 So, having run the 2014 Disney World Marathon this past January, I set my sights on the 2014 Disneyland Half Marathon to complete the challenge. Accepting the adage of go big or go home, I figured that if I was going all the way to California to run a race, I might as well run two! Thus, I accepted the Dumbo Double Challenge. After having already run the first 32.4 miles of these challenges (26.2 + 6.2 miles), I was a mere 13.1 magical miles away from achieving my goal. For the review of the race expo and the swag, check out Part 1 here. For the review of the 10k event, you can check out Part 2 here. I know I know, at some point I need to try out running in a costume, I am just not there yet. So my kit was similar to what I wore for the 10k, just in different color combinations: a SweatVac race hat, Adidas Climalite compression shorts, Reebok tank top, Hind running shorts, C9 wristbands, and Saucony natural series running shoes. Again I grabbed my Yurbud triathlon series headphones and my IPhone 5S, but again I did not make a custom playlist because of my ongoing issues with ITunes (it was my mistake). I found a Hidden Mickey in the start corral, it must be a good sign…check that, a great sign! When you run races in consecutive days, your race plan becomes that much more important. 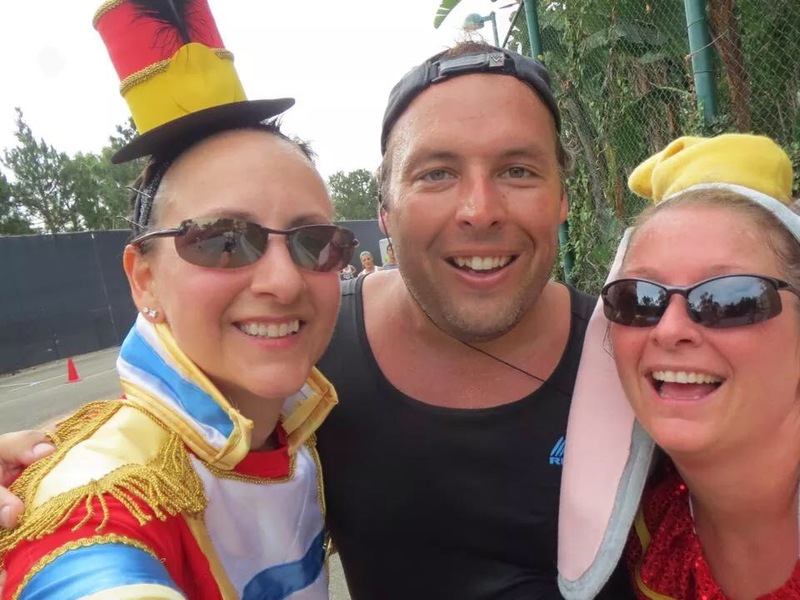 As you know, when I ran my first runDisney race (the 2013 Princess Half Marathon), I was so worried about being swept and just finishing that I did not enjoy the “event” as much as I could, and should, have. Since I had two more half marathons planned for later in September where I could push myself harder, I decided that I would soak up every minute of this race. Thus, I decided to take my time on the course, take lots of pictures and video (see the results in our YouTube video), and enjoy this experience. My race plan was a simple one: run the whole thing, but don’t hesitate to slow the pace when encountering something interesting, and stop often to take in the entertainment before resuming running. As a result, I logged my worst time ever running a half marathon, while having the BEST time ever running a half marathon. Just like with the 10k, it was a nice easy walk from my hotel to the start area, but this time I knew exactly where I was going. Again, bag check was expertly run, and there were ample port-a-potties, though the lines were a little bit longer today because there were more runners than there were on the previous day. Despite this, the lines were very reasonable. 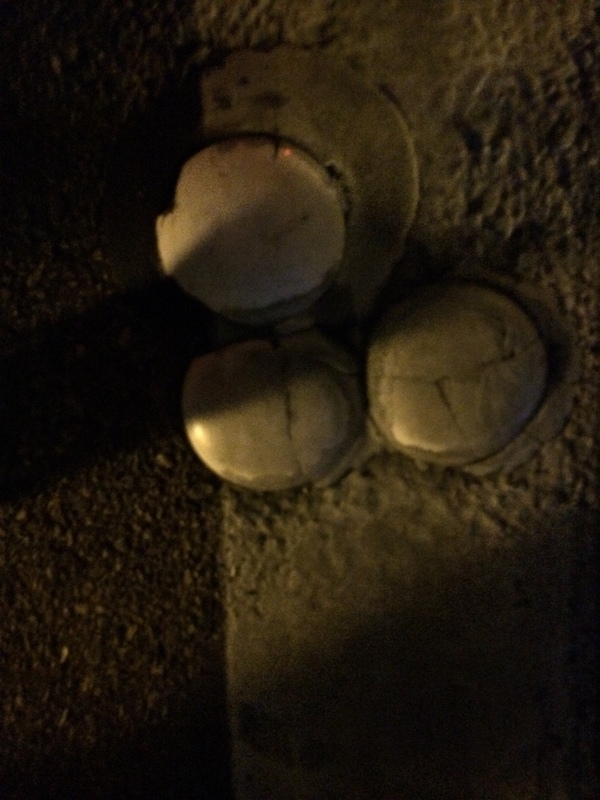 We loaded into the corrals, and, before the start, I discovered something awesome – a hidden Mickey! It was right there in the middle of the street where I was standing. As a Disney fan, this made my morning. There were fireworks for the national anthem, but not for the individual corral starts. There was, however, plenty of Let It Go. They played this song for each of the corral starts, which was fitting given the success of Frozen, but I heard from the runners in later corrals that the 10th time through the song was a bit much. I am sure my nephews would not have minded. We started out heading south, just as we had done the day before in the 10k, but instead of looping around the Anaheim Convention Center, we turned left onto Katella, and left again on Harbor, which put us into the parks much sooner. As I will discuss later, I felt like this was a mistake in the course design, as I actually enjoyed running around the Convention Center, which is quite nice, and would have been preferable to running an extra mile later in the race in the streets of Anaheim. We were soon in the backstage areas of California Adventure, and this is when I started to suspect that runDisney has been reading my features on www.Casual-Runner.com. I have been open about the fact that I think the best on-course entertainment is marching/pep bands and drum lines, and runDisney brought them out in spades for this event. These kids brought their game, they were going nuts, and I gladly accepted every high five line along the course, starting from this first one. 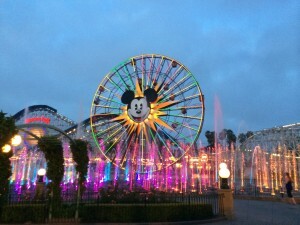 It is a magical World of Color. Unfortunately, the in-park courses were not quite as good as they were for the 10k, but they were nonetheless enjoyable. We entered from the side of Paradise Pier, and were once again treated to a special viewing of World of Color, which was awesome. But if you want the better World of Color experience, you really need to enter the 10k event (which is pretty darn close to perfect when it comes to World of Color). We continued along to Carsland and were welcomed by the glowing neon lights of Route 66 as we made our way into Radiator Springs. We ducked into the backstage area for a moment before returning onstage at the Tower of Terror and went past the Aladdin stage show before getting a glimpse of Carthay Circle Theater. Again, like the day before, the Disney cast members were out showing their full-throated, enthusiastic support for the runners. They were awesome and their support was greatly appreciated. There was no trip down the tunnel this time, but we did get to cross the Esplanade where a large crowd of supporters had gathered with their signs and cowbells to cheer us on. We entered through the main gates of Disneyland, where we were treated to a gorgeous early morning view of the Mickey Floral and the Disneyland Train Station. A quick duck through the tunnels and we were into Town Square, where the lead parade unit from the Soundsational Parade was there, fully aglow and joined by the very active drumline. This was an awesome welcome to Main Street USA. Remember how I said I was determined to soak in this experience? Well, this is where I was the most glad that I did. When I ran up Main Street USA during the 10k, it was a fun experience, but for some reason, during the half marathon, it was very different as it was much more emotional. I cannot describe why, but I was a bit overwhelmed by this surreal experience, and I slowed my pace to enjoy every moment of it. Instead of turning right into Tomorrowland (which I had done in every runDisney event so far in both Florida and California), we turned left toward Frontierland, past the rivers of America (and another awesome high five line from the Third Shift Custodial Team), Big Thunder Mountain Railroad, and into Fantasyland. Unexpected Magic. Now, remember how I mentioned how awesome and encouraging the Disney cast members were? Well, not all of them were, in fact, two in particular were not. Cinderella’s Wicked Stepsisters were at the Carousel telling us all how worthless and useless we were, and how we definitely could not “do it.” This was one of those uniquely Disney touches that I thoroughly enjoyed. Well done runDisney, very well done indeed. Race Icon. Now we were ready for the big payoff – the signature part of the course where we ran through Sleeping Beauty’s Castle and out into the Hub. No matter how many times I run through a Disney Castle (and this was my 4th time during a race event), this never gets old and never loses its magic. It is just a wonderful experience. Once on the Hub, we turned left and entered Tomorrowland, which was abuzz with the spinning Astro Orbiter and the arrival of Darth Vader and his Stormtroopers. Sadly, Space Mountain was not open, so no rides for us. This is a good point to observe that, while the 10k was lacking in character photo opportunities, the parks portion of the half marathon had many more character encounters. So if that is what you are looking for, this was the better event. We ran past the Matterhorn, made a brief appearance in Fantasyland, and then exited the park in Toontown. This is where the whole complexion of the course changed. Now, in speaking with my fellow runners, there seems to be a great deal of disagreement as to miles 4 to 9 of this course. Rather than trigger a huge argument here, I will simply say that your opinion depends on what your preference is. If you wanted to run fast and go for time, this was the part of the course where you could really trim your splits. If you wanted a “Disney” experience and prefer to run in the parks, you will be underwhelmed by this part of the course. I know that course design is a very difficult thing to do. However, if I could offer one suggestion to runDisney, it would be to minimize this portion of the course and take a more direct route to the Anaheim sports venues, and add that distance back in with both the parks (both on-stage and off-stage like was done in the 10k course) and the Convention Center area, all of which are far more entertaining than this section of the course (especially approx.. miles 5.7 – 7.2 where there is an inexplicable jog in the course). Part of the gang celebrating our 10k, Half Marathon, Dumbo Double Dare, and Coast to Coast Challenge finishes along Main Street USA in Disneyland. That being said, the community groups on this part of the course were pretty awesome. runDisney recruited a group of Mexican musicians and dancers, a highly-entertaining group of Polynesian dancers, more than 300 classic and custom cars (though I was more than a little confused by the 70’s vans with shag carpet and disco balls), and of course, MARCHING BANDS! I saw more trumpet players jumping up and down and high five lines than I have ever seen on a course. Like I said, I cannot get enough of marching bands and drum lines during a race event. We passed the Honda Center (home of the NHL’s Anaheim Mighty Ducks – so more than a few runners were doing their best “quacks”, ok, they are now just the Ducks, but you know what I mean), and onto the Santa Ana River Trail. Unfortunately, Southern California is in the midst of a significant drought, and the river was completely dry, so there was not much to see. The bigger concerns for me were all of the dust that the runners were kicking up on this trail, which at times made breathing difficult, and the random metal markers sticking out of the trail that were a serious tripping hazard. Even though runners were considerate and pointed these out for other runners, I did see a few runners stumble over them. Fortunately none of them went down, at least as far as I saw. Speaking of this, there is one thing that I should mention for anyone looking to enter an event in the Anaheim area. Earlier I mentioned the hidden Mickey I found in the starting corral, which consisted of 3 plastic lane markers. While this was cool, the lane markers (which are there for cars, not runners), are ever-present and a tripping hazard. While I did not personally have any issues with them, I spoke with one medical volunteer who said that they treated a large number of kids and parents who tripped and fell on these during the kids races and the 5k. So, as you should do every time you run, just be aware of your surroundings and watch your footing. Back to the course. At mile 9 runDisney got its groove back and in a huge way. We entered the parking lots to the Anaheim Angels Stadium (or is it the Los Angeles Angels of Anaheim, or the California Angels…I can’t keep track any more). There, we received our gel packets, some fluids, and the full-throated cheers of hundreds of local boy scouts and girls scouts. These kids were having a great time and their cheers were welcoming, but did not prepare us for what was about to come. Race Icon & Unexpected Magic. We entered the stadium through a tunnel and emerged from the right field wall. While I expected the stadium portion of the course to be good, I could not have prepared myself for what was inside. Thousands, and I mean thousands, of spectators packed the stands and were screaming and cheering in unison as we ran around the warning track. This was amazing, I even heard my name announced inside of a Major League Baseball Stadium! This was another one of those times where I was glad that I had decided to slow down and enjoy the race experience, as I stopped behind home plate for a few minutes to just soak it all in. We exited through the left field wall, through another tunnel, and were soon on our way back towards the Disneyland Resort. But first – more marching bands!! There were 3 or 4 different bands in the parking lot, all of whom were offering high five lines for us. We passed the new Anaheim transit center, and more marching bands! Seriously, just how many high school bands are there in Southern California? Because it seems like they all showed up to support us that morning. The drum lines were killer and I had some perfect timing as I happen to be looping around one band just as they started playing Sweet Caroline – with every runner around me singing along with the band. These are the unexpected moments you will always remember from race events. Tired yet? Because we still had to re-enter the backstage area of California Adventure just before the 12 mile mark, repeating part of the course from earlier. I actually enjoyed this stretch as the quarter mile or so preceding our entrance to the backstage area was lined with spectators and some runners who had already finished, and just past the 12 mile mark was the same marching band from earlier. What was particularly impressive was how these kids were still going strong more than 2 hours into the race. A little bit of runDisney magic as I was fortunate enough, after 18.3 miles, to finish the last mile with my friends. Unexpected Magic (repeats itself). After more than 18 miles run during the Dumbo Double Dare, who do I happen to encounter in the last 3/4 of a mile? Gail and Kim! We could not believe our luck. Gail and Kim had started in Corral A, I started in F. We all stopped for numerous picture opportunities along the course, and ran our own races. Despite this, as luck (and a little runDisney magic) would have it, we found each other in the final stretch of the course. We hugged, took a few pictures, and needless to say, we finished the race together. We could not have scripted a better ending to this wonderful event. The streets of the final mile were packed with excited spectators and we fed off of the excitement and enthusiasm that they generated. This was without a doubt the most intimate finish area I have ever experienced, but, at least for me, it did not feel at all crowded. Mickey, Minnie, Pluto, and Goofy were there to welcome us to the finish line. As we crossed, the race announcer congratulated Kim on earning her 50th runDisney medal. Congratulations Kim, what an accomplishment. The SMO collection: not a bad haul of hardware for two days of running. One word: awesome. runDisney always does a great job with their event medals, and these SMOs were no exception. The Disneyland Half Marathon medal has a true classic design. It is clean, nice, and embodies the history and class of the Disneyland park. The Dumbo Double Dare Challenge medal is equally fitting of the event as it is colorful and playful. Filling out the set, the Coast to Coast Challenge medal? Just perfect. It is simple in its design, prominently displaying the Partners statue. It is both a great race medal and a prized collectible for any Disney fan. All of the medals are substantial and of very high quality. Additionally, they each have custom – and very nicely designed – ribbons. The intricate artwork on the ribbons further shows runDisney’s commitment to high quality SMOs and adds to the overall quality of these prized keepsakes. In short, the SMOs make accepting runDisney race challenges worthwhile. I know I am jamming a lot in here, but it was such a great event and deserves its due. I should mention that I finished this race extremely well-hydrated, and that was directly the result of the efforts of the runDisney staff and volunteers in staging and running great hydration stations. They do this better than any other race organization I have yet experienced. Speaking of water…yeah, I made a mistake. Yesterday I mentioned that I had ridden a water ride after the 10k event, and as a result of walking around in wet socks and shoes, developed blisters. TMI alert. The night before the half marathon I drained and cleaned the blisters, and did not have any difficulties or discomfort during this race. However, after the half marathon, I just could not resist riding Splash Mountain with my family. We got SOAKED (my cousin even lost her cell phone when it got flooded – literally – on the ride), and again I was left walking around in wet socks and shoes. As a result, the blisters came back with a vengeance and were even worse. So I have been forced to lay off of running while they heal. The water rides at Disney are awesome, and if you want to ride them, I would definitely recommend having a pair of flip flops or a change of shoes so you don’t wind up with blisters like I did. I wore my medals around the parks after the race, which is a must do for every runDisney event. I cannot tell you how many people came up to me to ask about the medals, and a few of them even told me that they really wanted their own medals and would seriously consider entering a future event. After talking with these fellow park goers, it is my hope that some of them have found sufficient motivation to go out and run their own first mile. Would I do the Disneyland 10k, the Disneyland Half Marathon, and the Coast to Coast and Dumbo Double Dare Challenges again? Absolutely. I had such a great experience during this race weekend that there is no question that I would do it again. At first I thought that running a 10k and half marathon in consecutive days would be a little daunting, but I took it all in stride and found that taking on this challenge really enhanced my enjoyment of the entire experience. Additionally, my entire runcation experience was enhanced by three main factors. 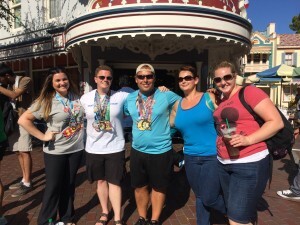 First, my cousins, who are not runners, used this as an opportunity to come out to Disneyland and enjoy a long weekend in the parks and a mini-family reunion. We all had a tremendous time catching up and spending time with one another. Second, I was able to reconnect to with my running friends – Gail and Kim – who I seem to only get to see at running events, but will make a point to see at every running event that I can (and, since they do Run All the Races, I am confident this will be often). Third, as a direct result of this trip and the power of social media, I made an amazing group of new friends: Amy, Amber, Tim, Christina, Ashley, and David. 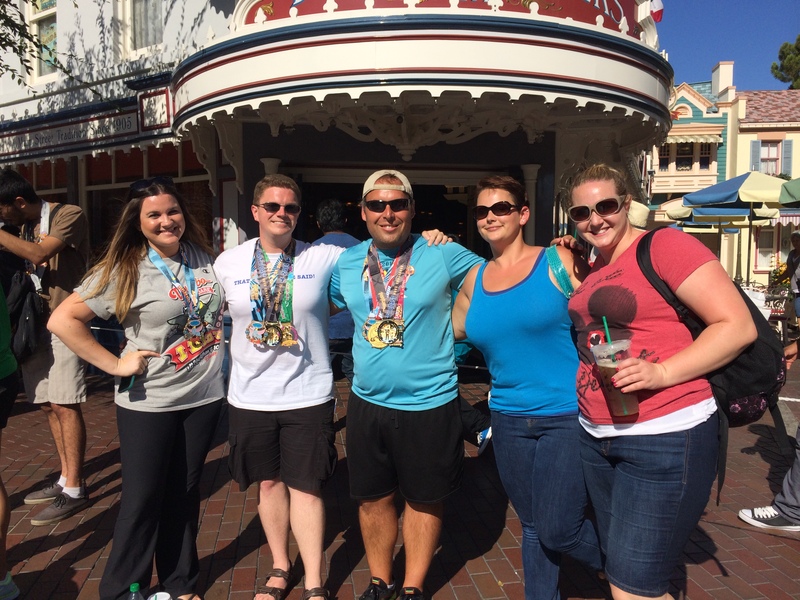 We had never met before the Disneyland Half Marathon Weekend, but we had an amazing time together and quickly developed lasting friendships. 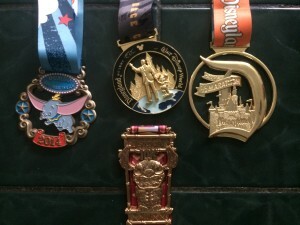 I don’t want to say that we have a running problem, or more specifically a runDisney problem, but we are already planning to take on the Dopey Challenge together in Walt Disney World this coming January, so I am certain that there will be plenty of great stories to share from that event, so stay tuned! Do you want to see and experience the 2014 runDisney Disneyland Half Marathon? Come along the entire course in our latest YouTube video. If you want to learn even more about Mike’s experiences during the weekend, please follow us on Twitter and Instagram and see Mike’s live tweets from the Disneyland Resort. We have more videos from Disneyland Half Marathon weekend, and the 10k, along with videos from the Princess Half Marathon and other challenges on our YouTube channel. We hope you enjoyed this coverage of the 2014 runDisney Disneyland Half Marathon weekend. The Casual Runner Team wants to hear from you. If you have any questions about anything we cover here on Casual Runner, if you have any questions regarding running gear or training for your own Casual Running needs, or if there is anything that you would like us to cover on Casual Runner, please leave a comment or email us using the links below. To ensure that you do not miss all of the great content from Casual Runner, please be sure to like us on Facebook, follow us on Twitter and Instagram, subscribe to our YouTube channel, and add us to your circle on Google+. See you out on the running trails!